Attractively housed in brushed stainless steel, this digital toaster not only adds sophisticated style to any kitchen counter, but it also provides useful everyday convenience. The unit's two long slots easily accommodate longer slices of bread or up to four standard slices of bread at a time; the slots also offer an extra-wide size, which allows for thick slices of homemade bread, bagels, English muffins, and more. 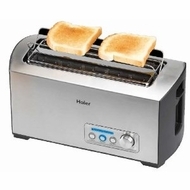 To use, simply drop the item to be toasted into the slot, turn the dial to select the shade setting from light to dark, and start the toasting process by pressing down on the lever, which lowers the bread into the heating chamber. In addition to the shade-setting dial, the unit's side control panel features a digital display, which indicates both the shade setting and the toasting process, and three blue-backlit control buttons that make it easy to select the "defrost", "reheat", or "cancel" function. The toaster also provides an integrated warming rack for heating croissants, buns, rolls, and other baked goods. Other highlights include high-lift extension for safely removing smaller pieces of bread, a removable crumb tray, and cord storage to help keep countertops looking tidy. The toaster measures 7 by 14-2/5 by 7-1/5 inches.